Rowan Gorilla I (continued from page 42) 507-feet-tall legs and 160-feet-tall drilling derrick, a Gorilla rig com- prises approximately 16,000 tons of steel. Its triangular hull is 297 feet long, 292 feet wide, and 30 feet deep. The rig's large size pro- vides nearly one acre of deck space for storage of consumables used during drilling. This ample stor- age capacity along with certain design features make the rig com- patable with hostile offshore areas where it can continue to drill even if the flow of supplies from shore were interrupted. Gorilla rig is designed to survive up to 90-foot waves and 82-knot winds while drilling in 328 feet of water. The rig has power to spare, with seven Caterpillar D399 diesel en- gines with a total output of 11,080 bhp at 1,225 rpm driving seven generators producing a total of 7,210 kw. Power for the Gorilla's propulsion assist system is pro- vided by eight electric motors with a total output of 6,800 hp con- nected through gearboxes to two 112-inch propellers in Kort noz- zles. These motors are mounted on the machinery deck on either side of the drilling slot. When using a 10,000-bhp tug, the assist thrus- ters will increase the towing speed by about two knots. Living accommodations are pro- vided for 80 persons, as well as a six-bed hospital, dual galley, din- ing room, and recreation facilities. Coast Guard approved and fitted with internal communications sys- tems. A heliport cantilevered out over the bow has a diameter of 83 feet and 52,500-pound impact load. Marathon's rig yard in Singapore and one at the Vicksburg yard. Goldman L-907 Pacesetter types, and were constructed at a price of $80 million each. These rigs are capable of 25,000 feet in water depths up to 1,500 feet. Living quarters are provided for 96 persons. Bates Drilling Company of Hous- ton, and one each for Houlder Off- shore Drilling Company and At- lantic Drilling Company, both of the U.K.
A semi-submersible rig for Ko- rea Drilling Company is now un- der construction at the Okpo yard. With this rig's delivery in the spring of 1984, Korea Drilling will be the first Korean company to own a drilling rig it operates. The rig will be used to explore Korea's continental shelf and other na- tional coastlines. Company of Bakersfield, Calif., and Houston. Sedco 602 can operate in water depths of 25 to 180 feet. The moor- ing tensioner riser and drill fluid systems have been designed for exploratory and development drill- ing to 20,000 feet. The design of this semi-submersible makes it particularly useful in parts of the world where drillships are ineffi- cient and the cost of using huge semi-submersibles uneconomical. Now there's no need to put up with long factory deliveries on A.C.
Control Distributors now stock a larger assortment of popular sizes to meet MIL and I.E.E.E. 45 specs. They also carry a wide selection of con- trol relays and replacement parts for magnetic contactors. So make it easy... just call our nearest Stocking Navy/Marine Distribu- tor in your area. New York Argo International Corp. .
Charleston Ace Electric Supply Co. .
Virginia Beach... B 8c D Electric Supply Inc.
American Bureau of Shipping and is built to requirements of the U.S.
Dallas between November 1982 and July 1983. Delivery of these new offshore rigs brought the Sedco drilling fleet up to 42 units; the company reported that all rigs were under contract. 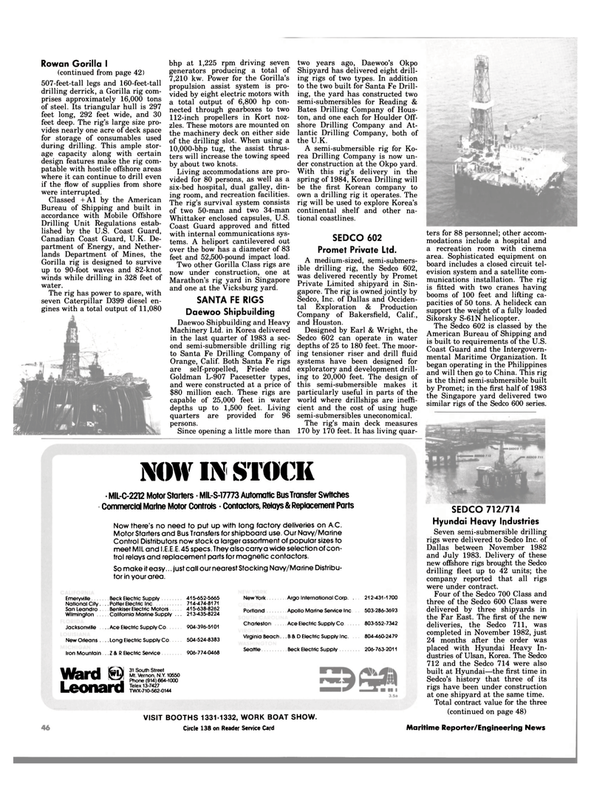 Sedco's history that three of its rigs have been under construction at one shipyard at the same time.